Feed your adrenaline addiction. Incredible Adventures has teamed with some of the world’s most elite skydiving professionals to create a series of mind-blowing skydives guaranteed to kick start your heart and send your pulse racing. Incredible Adventures offers the kind of skydiving you can’t experience by showing up at your local airport and whipping out a credit card. We specialize in extreme jumps requiring special training and/or jump logistics. Skydive at the North Pole. Jump from 30,000 feet high, wearing oxygen. Simulate a SEAL team mission. See Everest from the sky and more. No prior skydiving experience is required. Journey to Nepal for one of the world’s most extreme skydiving events. Leap from a high-flying helicopter and land on the world’s highest drop zone. See Everest from a parachute. The Everest Skydive combines extreme skydiving with mountain trekking and culture into a multi-day incredible adventure. 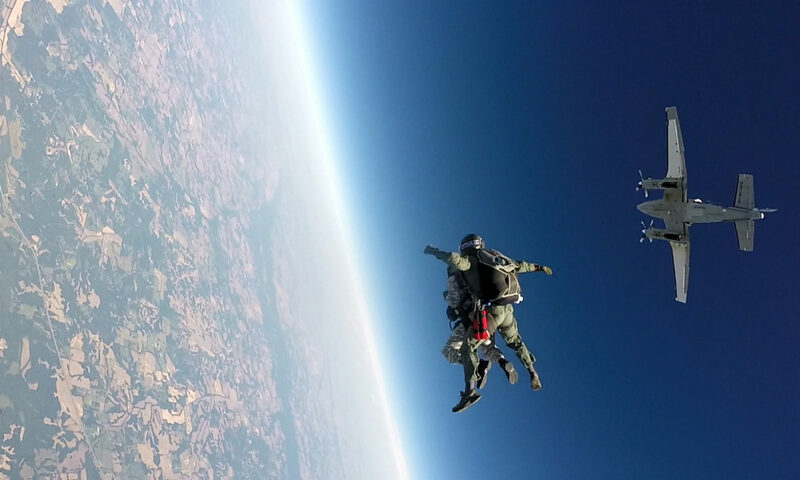 High Altitude, Low Open military-style skydives. Experience the thrilling high-speed freefall. Jump from a perfectly good airplane above 28,000 feet reaching speeds in excess of 200 mph on your way back to earth. High Altitude, High-Open, military-style parachute jumps. Spend up to 20 minutes flying under canopy. Jump from an altitude just below the stratosphere and feel the pop of your chute within seconds. Then you’ll literally “hang out”, suspended in air while piloting your way to the drop zone. We’ve been creating custom air and space adventures for nearly 25 years and can provide the right team and equipment for virtually any mission, including production services for film/video/ tv. Perhaps you’re searching for an awesome incentive, prize or reward. We also organize skydiving experiences involving unique events, holidays and celebrations. Call today to see how we can work together to create something amazing and life-changing.